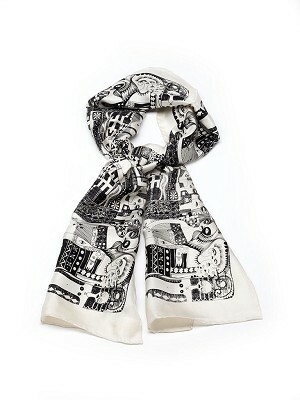 This "Urban Immigrants" scarf is based on the intricate drawing of Tola Wewe, a Nigerian artist, in 2004. The original drawing is ink on paper and portrays four females against varied designs. This piece is part of the Denver Art Museum's African Art Collection. Oblong 54" x 9.5"; 100% silk; dry clean only.